Please note, we’ve extended the deadline to February 18, 2019 at 5 p.m. All themes appropriate for public display are welcome! Artists Up is pleased to once again partner with Cornish College of the Arts to present an exhibition of visual artwork to be held during the month of April 2019 in the Gallery of the Cornish Playhouse located on the Seattle Center campus. Approximately 20–30 pieces are expected to be selected for this group exhibition. Artwork may be listed as available for purchase, with no commission requirement. Artists who have engaged in Artists Up activities, including artists of color and artists with disabilities are strongly encouraged to apply. NEW Deadline: February 18, 2019 at 5:00 PM PDT. Download the Guidelines to Apply. If you were not able to attend our Career Up series of three, free, informal, moderated discussions by and for artists, you can now watch them on video. This series came about after meeting with and listening to artists to find out what they need, outside of other available training opportunities, to expand their professional practice. Visit the links below to learn more. This fall, Artists Up is pleased to offer Career Up, a series of three, free, informal, moderated discussions by and for artists. This series came about after meeting with and listening to artists to find out what they need, outside of other available training opportunities, to expand their professional practice. Each Career Up session will be held at the Cal Anderson Park Shelterhouse, located on Capitol Hill in Seattle. Light refreshments will be served. The Shelterhouse features a cozy gas fireplace and is wheelchair accessible. Street parking is available, but challenging. We encourage public transportation including: Light Rail, Bus Lines [8, 9, 10, 11, 43, 49, 60], or the First Hill Street Car.Register for one, two or all three events. All are welcome! Cornish College and Artist Up celebrate three artists who were selected for exhibition at the Cornish Playhouse through a partnership with Artists Up. The artwork of Nguyen Ly Phuong Ngoc, Kamari Bright, and Blanca Santander will be on display through November 19, 2017. Artists – Need time and space to focus on your work without daily distractions?Come learn about artist residencies available to you, here in the Pacific Northwest. Meet residency staff who will answer your questions about their respective opportunities for artists. Featured residencies include: Mineral School, Rockland Residency, Centrum Residencies, Bloedel Reserve, MadArt, Recology Cleanscapes, Artsmith, and the Laboratory Residency. Additionally, local artists including: Romson Bustillo, Mary Coss, Brent Watanabe, and Jane Wong will share their experience and the benefits they gained. ARTISTS UP serves all artists and extends a special invitation to this event to artists of color and those often underserved by career advancement opportunities. This event is open to artists working in all creative disciplines. Cornish College of the Arts is committed to the support of local artists working in both the visual and performing arts. The Cornish Playhouse, a vibrant theatrical and educational facility, is reaching out to visual artists who have participated in any of Artists Up’s activities, to exhibit their work in the lobby of the Playhouse from October 16-November 19, 2017. An exhibition opening will take place on October 23rd, 6pm-8pm. If you are interested in participating, please read the Cornish Playhouse Exhibition Opportunity before the deadline on September 18, 2017 at 5:00 PM. ARTISTS UP Grant LAB Shout Out! On May 10th, Artists Up Grant LAB recipients, gathered at Oxbow in Seattle’s Georgetown neighborhood to share information about their inspirations, current projects, and upcoming events. More than fifty attendees enjoyed a spring evening – learning about the diverse art practices of the Grant LAB recipients. Thanks to our amazing volunteer Andy Goodman, the team at Oxbow, artist Michelle de la Vega, and our neighbors at Prairie Underground for helping to make this event happen. ARTISTS UP Grant LAB awards announced! We’re thrilled to announce that eighteen artists from Washington State were awarded funds from Grant LAB! Congratulations to Kamari Bright, John Bunkley, Danielle Christian, Alex Crozier, Lynn DeBeal, Rome Esmaili, Kiana Harris, Sarah Moreno León, Emma Levitt, Xavier Lopez, Sarah Maria Medina, Marilyn Montufar, Tamiko Nimura, Sandra Pressley, Gabriel Teodros, David Tucker, Gordon Wood, and Miriam Zmiewski-Angelova. Learn more. We’ve closed applications for our Grant LAB, an experiment of Artists Up, offering cash awards of $3,000 to Washington State artists working in all disciplines, to enhance their creative process. We are currently in the organization and review process and we will be notifying all applicants about the status of their application by mid-December. If you applied – thanks for experimenting with us! At the end of 2015, the Artists Up team brought together a group of artists of color, to assist us in rethinking, reworking and revolutionizing the peer-panel review process. The panel process was noted as a high priority in our final report, Learning from Artists: Four Focus Groups Conducted for Artists Up. We look forward to continuing to work with artists to deconstruct and rebuild new components of funding and commissioning practices throughout 2016! Check out the responses from our facilitated meetings that were collected in a final report, Learning from Artists: Four Focus Groups Conducted for Artists Up. If you participated in any of our previous events and would like to learn more about what’s next, please join us on October 27th at the Frye Art Museum (704 Terry Avenue Seattle). Doors will open at 5:30 pm and at 6:30 pm we will have welcome remarks and information about our future plans. This event is FREE to all past Artists Up session attendees and one guest. RSVP’s strongly encouraged. We had a great time on June 8th – reconnecting with artists we’d met throughout our recent Artists Up efforts, as well as new artists who are interested in exchanging information about funding, opportunities and other resources for artists. Thanks for your participation and extra thanks to our host, ArtXchange Gallery! Artists Up is pleased to invite artists who have participated in our past events, as well as artists interested in learning more about our goals and networking with other artists in the region – to a celebration and networking event. Light refreshments will be served. Monday, June 8, 2015, 6:00—8:30 p.m. This event is FREE, but RSVP required due to limited space. Between 2013-2015, Artists Up presented a series of focus groups, networking events and resource programs for and with artists from the Latino/a; Asian/Asian-American/Pacific Islander; African /African-American/Black and Native communities. This work is an effort to improve and expand services and resources for artists of color in our region. This event is to thank all of the artists we have connected and worked with throughout the series. It is also an opportunity for diverse creative communities to share ideas, promote their work, explore collaboration and get to know each other. Come celebrate with us! 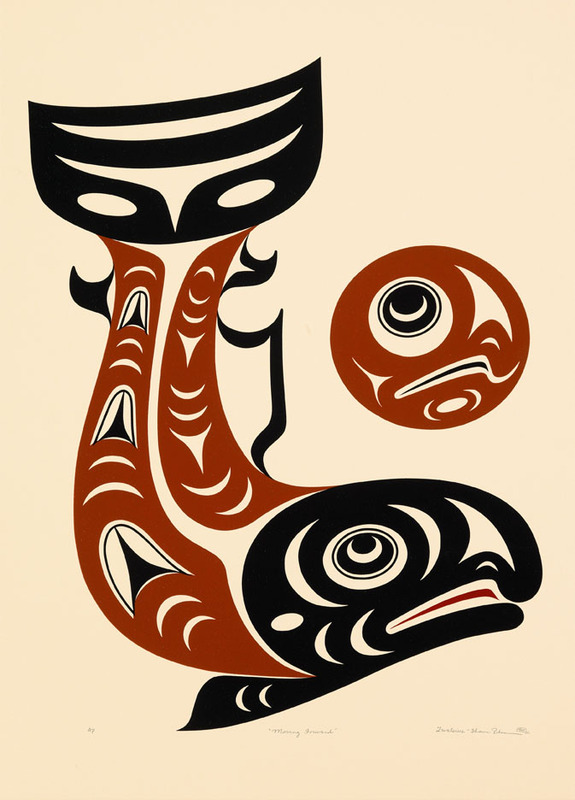 Join the Seattle Office of Arts & Culture, 4Culture and Artist Trust for a FREE, informal evening at Daybreak Star Indian Cultural Center to learn about art resources and to network with fellow Native artists. Light refreshments will be served. DATE: Monday, April 20, 2015, 5:30—8:30 p.m.
WHO: This is an opportunity for Native artists to learn about services and funding opportunities, chat with local funders, and meet other artists in the community.Artists creating in dance, literature, media, music, theater, visual, and public art are welcome to attend. Click here to RSVP (via Eventbright). Share the event with your friends on Facebook. Light refreshments will be served and art activities for school-aged kids (5 years and older) will be available upon registration for attendees who require child care. HAVE KIDS? : Sign up for art activities for school-aged kids (5 years old and older) when registering. We also invite you to visit our facebook page to find out about upcoming opportunities open to artists in our region. You may also be interested in these findings from our work to date. ARTISTS UP invites you to a social mixer celebrating the two communities we’ve had the pleasure to work with during the launch of the ARTISTS UP program. Art by Romson Bustillo, music by Miho & Diego. Mix and meet old and new friends in the Latino/a, Asian, Asian American and Pacific Islander artist communities. All are welcome! RSVP requested.. RSVP requested. Join us for a FREE informal evening at the Northwest African American Museum (NAAM) to learn about art resources and to network with fellow African and African America Artists. Light refreshments will be served. 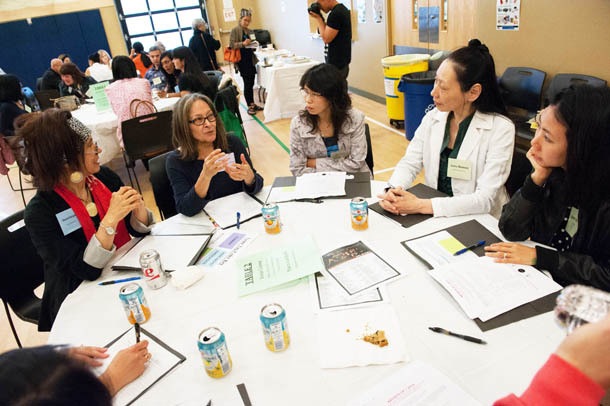 Chat with local funders, including Heather Dwyer (4Culture), Marcia Iwasaki (Office of Arts & Culture), Irene Gomez (Office of Arts & Culture), Barbara Mizoguchi (Artist Trust), Mayumi Tsutakawa (ArtsWA), and Cath Brunner (4Culture). Artists creating in dance, literature, media, music, theater, visual, and public art are welcome to attend. Register here by October 1 to guarantee an information packet. Day of event walk-ins are welcomed. Don’t miss the opportunity to meet the ARTIST UP Peer Artist Ambassadors for this event: Natasha Marin, Christina Orbé, Marita Dingus, Yonnas Getahun, Amma Anang, and La-Tonia Denise Willis! 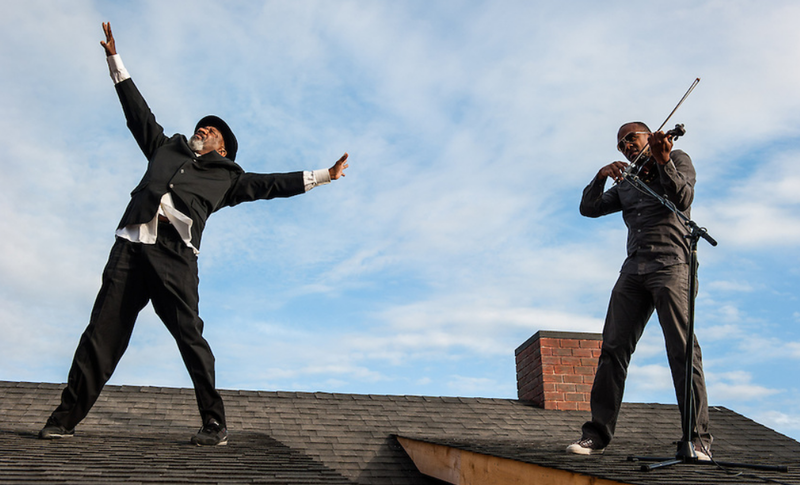 Donald Byrd and violinist Quentin Morris, atop Heather Hart’s The Western Oracle: We Will Tear the Roof Off the Mother, a 2013 installation at the Olympic Sculpture Park. On Monday, June 9, 2014, Artists Up hosted a dynamic evening of resources and networking for Asian, Asian-American, & Asian Pacific Islander artists. The event brought together over 60 artists of varying artistic disciplines with the goal of growing relationships between artists and funders, as well as demystifying funding programs and processes. A big, heartfelt thank-you to our host and outreach partner, Asian Counseling and Referral Service. We enjoyed a tour of ACRS’ impressive art collection, sampled amazing Vietnamese food from the Rainier Valley, and learned a great deal from each other. © 2014 Bruce Clayton Tom. All Rights Reserved. No commercial usage without negotiation. We had a great event on February 20th from 6-8 pm at Fulgencio Lazo Studio (at Casa Latina in Seattle). This was a follow up to the successful Artists Up workshop series held in the summer of 2013. Artists Up partnered with La Sala and Día de Muertos Committee for a lively social event that provided opportunities for artists working in all disciplines to network in a relaxed environment. The event was held at the studio of local artist Fulgencio Lazo. Works on display will included paintings by Fulgencio Lazo, Jose Orantes and Jesús Mena. Ambient music was all by local Latino artists, curated by Jacque Larrainzar. A full play list was provided. Everyone had a chance to hang out, enjoy some homemade tamales, tostadas de tinga and a glass of wine with fellow artists and community members. 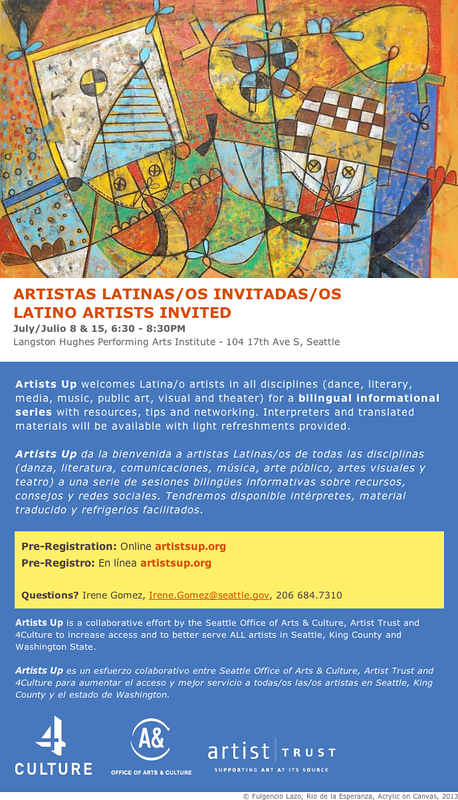 In 2013, ARTISTS UP focused on the Latino community, representing the largest population of immigrants and English language learners in Washington State. Bilingual materials were provided. Session I – Meet the Funders, took place on July 8th, 2013 and was open to the public. This session provided artists an opportunity to learn about funding and commissioning programs offered by each entity. Session II – Meet the Artists, took place on July 15th, 2013 and was open to the public. Five artists who have received funding in the past from Artist Trust, 4Culture, and/or the Office of Arts & Culture presented anecdotal accounts of their path to success. Session III – Focus Group took place on July 22nd, 2013 and was by invitation only. Artists representing all disciplines (music, media, dance, theater, visual and literary arts) participated in a focus group facilitated by Claudia Bach of AdvisArts.